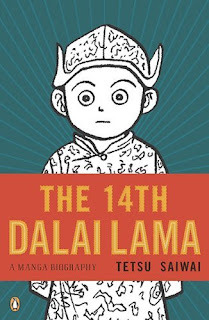 First, a shout-out to Kate Dacey for sending me a copy of The 14th Dalai Lama: A Manga Biography by Tetsu Saiwai. Not only is Kate a darn fine internet presence with regards to her blogging, reviews, etc., but she's been gracious enough to share books with other folks, and I figure I'm going to have to follow that example at some point. OK, the story itself is, as should be no surprise, a biography of the current Dalai Lama. The book starts with the death of his predecessor, progresses to his discovery and education, picks up the invasion of Tibet by China, and carries through to his escape into India. From there, it quickly wraps up his general teachings and philosophies, and how he's tried to apply that towards freeing Tibet for the better part of the past 50-some years. I have to admit to coming to the book with a fair amount of ignorance. I did hear the Dalai Lama speak once at my college in the early 1990s, but it was mostly a talk on Buddhism generally and he didn't discuss his own past or Tibet very much. Before reading the book, I was certainly aware of Tibet's on-going struggle for independence from China, but I was unaware of the particulars. So from that standpoint, the book was very interesting and informative. I definitely have a much greater appreciation for the Dalai Lama himself and what his homeland has gone through. It did, I thought, a very good job of showing who the Dalai Lama is and where he came from, and it did it in a way that was engaging. The one complaint I might wage on the story is that there are some seemingly significant gaps in peripheral characters. There's an early emphasis on the Dalai Lama's family, for obvious reasons, and various members continue to pop up throughout the book, with a noted appearance by his mother as they flee to India. But his father simply drops out of the story. Presumably, he died at some point, but it's not mentioned or referenced in any way. That'd be okay, I think, except for the repeated inclusion of his mother and the early emphasis on both his parents. Similarly, a visitor from Europe shows up who the Dalai Lama invites to stay in order to teach him more about that continent. The man agrees, but then disappears for 20-some pages. When he does pop up again, it's three years later and only appears in one panel to say good-bye. Admittedly, trying to cover someone's entire life story in a relatively small book is no easy task but, from a storytelling perspective, the inclusion of what are seemingly significant characters could have been handled more deftly as the story progressed. That being said, it's still a laudable book. I don't think there's necessarily an attempt to push the boundaries of sequential art here, or provide a perfect story for readers. The goal, it seems to me, is to inform. Saiwai is out to educate people on the Dalai Lama, Tibet and civil rights. To raise awareness of what China has done to Tibet and its people. To let people know what kind of struggle has been going on there for so long. That, indeed, is a worthy goal and, as I said, Saiwai does a good job of educating and engaging the reader here. Is this the best version of the life story of the Dalai Lama? I honestly have no clue; as I said before, this is really first foray into learning about him. But it definitely gets thumbs up for the choice of media, though, and I expect there are others like me out there who wouldn't mind seeing more biographies and histories told in this form. Hi, Sean! Thanks for the shout-out. Glad to hear your take on the book. I'd seen Kundun several years ago, so I couldn't help comparing the manga with the movie, as they cover the same time period and events from the Dalai Lama's book. If I hadn't seen Kundun first, though, I suspect I would have found the manga more useful.